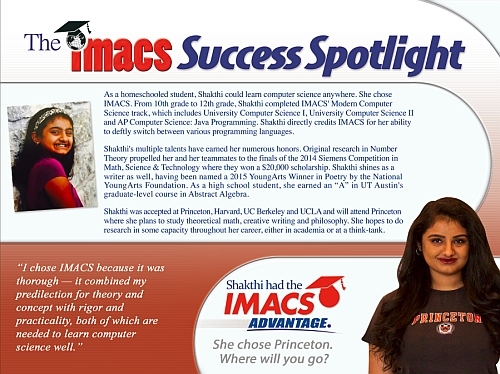 Congratulations to IMACS graduate Shakthi Shrima who will attend Princeton this fall. As a homeschooled student, Shakthi could learn computer science anywhere. She chose IMACS. From 10th grade to 12th grade, Shakthi completed IMACS’ Modern Computer Science track, which includes University Computer Science I, University Computer Science II and AP Computer Science: Java Programming. Shakthi directly credits IMACS for her ability to deftly switch between various programming languages. Shakthi’s multiple talents have earned her numerous honors. 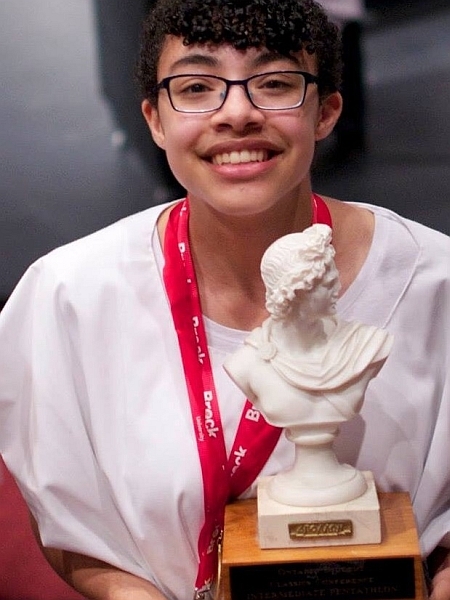 Original research in Number Theory propelled her and her teammates to the finals of the 2014 Siemens Competition in Math, Science & Technology where they won a $20,000 scholarship. Shakthi shines as a writer as well, having been named a 2015 YoungArts Winner in Poetry by the National YoungArts Foundation. As a high school student, she earned an "A" in UT Austin’s graduate-level course in Abstract Algebra. Congratulations to IMACS graduate Jacob Cordeiro who will attend Harvey Mudd this fall. Jacob began homeschooling in 3rd grade. 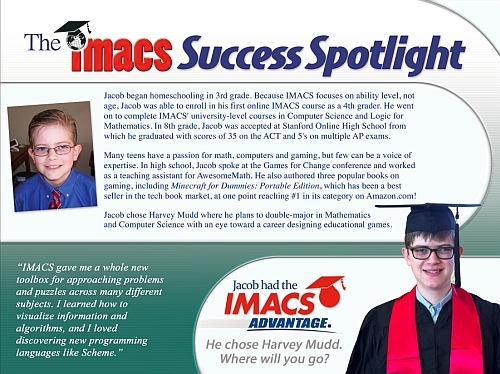 Because IMACS focuses on ability level, not age, Jacob was able to enroll in his first online IMACS course as a 4th grader. He went on to complete IMACS’ university-level courses in Computer Science and Logic for Mathematics. In 8th grade, Jacob was accepted at Stanford Online High School from which he graduated with scores of 35 on the ACT and 5’s on multiple AP exams.